Finely powdered form of the following: Amrita, Jambu (black berry), Katuki, Nimba, Kirata Tiktaka (Chirayata), Gudamara, Karavellaka (bitter gourd), Kutaja, Go-kshura, Karcura, Haridra, Kala-megha, fruit of Babbula, Krishna Jiraka, Ativisha (pungent variety), Ashwagandha, Bilva, Triphala (a collective name for Haritaki, Bibhitaki & Amalakl) and adventitious roots of Vata, Shilajatu, Methika, etc. Activates the pancreas and helps it to secrete a balanced quantity of Insulin, through which extra Glucose gets converted into Glycogen. Removes weakness & irritation, as well as increases the capacity of the brain by making it strong. Cures the numbness of hands & feet and makes the nervous system strong. 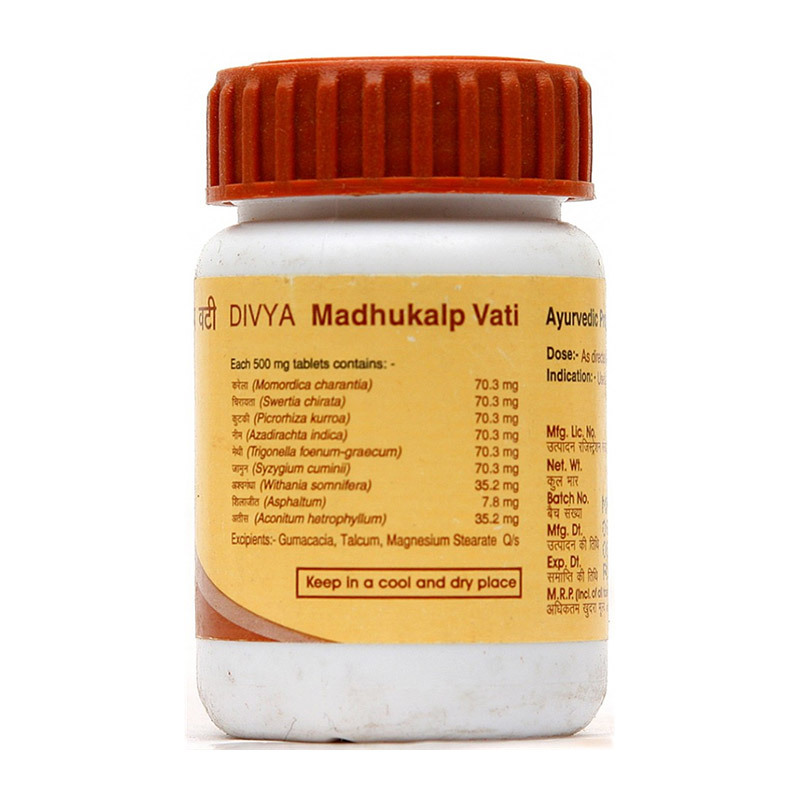 Removes complications like exhaustion, weakness & tension caused by diabetes. Protects the patient from morbid thirst, frequent urination, loss of weight, blurred of vision, tingling sensation, tiredness, infections of skin, gums & urethra. Strengthens the immune system & increases hope as well as self confidence. Take it one hour before breakfast and dinner or after breakfast and dinner with luke warm water or milk. If patient takes insulin or allopathic medicine, then he should test the level of his blood-sugar two weeks after the intake of this medicine. As the level of sugar becomes normal, the dose of allopathic medicine should be reduced gradually. After the stoppage of allopathic medicine, when the level of blood sugar is reduced and becomes normal, the dose of this medicine should also be reduced gradually. 1 - 2 tablets, twice a day.